Posted by Iris Bella on 21/03/2017 5:07:31 PM. If you are one of those iPhone users who love to use WhatsApp for messaging, then you must have a pile of conversation list stored on WhatsApp messenger. When you have a long list of chat history, there is a high chance of having important conversations like business queries or certificate photos deleted by accident, which could bebe a huge disaster. You can always use iTunes to backup WhatsApp chat and WhatsApp has in-built feature to back up daily chats. But these backups are read only databases that you can only use to restore an entire backup history. You cannot manually restore selected chats using those backup files. So, the question is how we can back up our WhatsApp chat without any restrictions. Fortunately, you can transfer WhatsApp messages and attachments from iPhone to PC. In later, you can use them to restore WhatsApp chat history whenever you like. If you don't know how to transfer WhatsApp messages from iPhone to PC then in this tutorial we will show you how to do that using Mobiledic WhatsApp Transfer Plus. 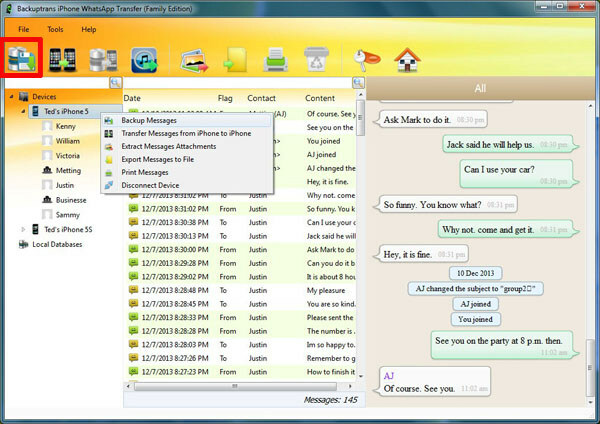 Mobiledic WhatsApp Transfer Plus is a desktop software which helps you to transfer WhatsApp chat messages from iPhone to PC or Mac with just a few clicks. Not only that, you can use the same software to transfer WhatsApp messages from iPhone to Android, Android to PC and extract WhatsApp messages and attachments on your computer. All can be achieved using one software. Download the software from their official website on your PC and install it in your desired location and launch the program. After you have installed the program, it is time to connect your iPhone to PC using a USB cable. Let the software detect your iPhone. This process may take some time depending how quick it recognizes your device. If you have done the above steps properly then the software will show all the WhatsApp messages on the main interface of the program. You can connect multiple iPhones to your PC and the software will show all the recognized device. Select the device from which you wish to transfer your WhatsApp messages from iPhone to PC. Right click on the iPhone icon in the left sidebar followed by "Backup Messages" and let the software transfer all WhatsApp chat history from your iPhone to PC. 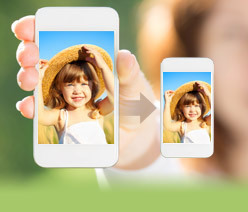 This process may take some time depending how much data it is transferring from your iPhone. Alternatively, you can only transfer the selected messages from iPhone to PC. Click on the iPhone icon again but time let the software show your contact list. From there, select the contact name from which you want to transfer the messages and click on "Backup Messages with this Contact". Note: It is recommended to close WhatsApp on your iPhone first and then start the process. Also, it is very important to keep your iPhone connected with your PC until the process is finished. You can use the same software to transfer WhatsApp messages between iPhone to Android and so on. 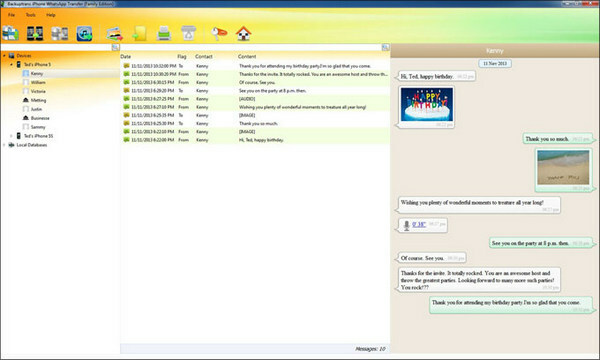 You can even take a print out of a selected conversation. The same method can be used to transfer WhatsApp messages from iPhone to Android or Android to iPhone or Android to PC as well. It is very important to back up your WhatsApp messages if you use it regularly. If your iPhone crashes or damaged or stolen then you will never be able to get them back if you don't create a backup file of your WhatsApp messages and will end up losing your valuable chats, pictures and videos. There are lots of tools available in the market but it is recommended to using Mobiledic to get the task done smoothly.